Vicky Tauli-Corpuz is a UN Expert on Human Rights, an institution and movement builder, and community organizer. She is currently the UN Special Rapporteur on the Rights of Indigenous Peoples, appointed to this post in 2014. Her experience in fighting for human rights dates back to the early 1970s when she became part of the anti-dictatorship struggle against President Marcos in the Philippines and the assertion of indigenous peoples’ rights to self-determination. She took part in several struggles, which included, among others, the fight against a World Bank funded project, the Chico River Hydroelectric Dam, which would have displaced 100,000 Igorots from their ancestral domains in the Cordillera region in the Philippines. The Igorots succeeded in stopping this project. She was also part of the struggle against the Cellophil Resources Corporation, a company of a crony of Marcos, which was seeking to deforest pine forests, including those in her ancestral territory. Vicky is a Kankanaey Igorot. 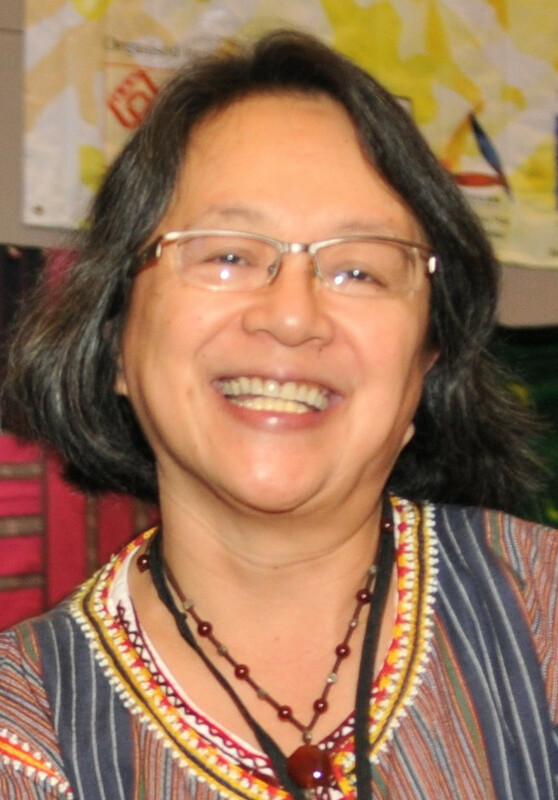 As part of her human rights commitment, Vicky became involved in the drafting, negotiations, and adoption of the UN Declaration on the Rights of Indigenous Peoples from 1995 to 2007. She chaired the UN Permanent Forum on Indigenous Issues from 2005 to 2009. As a movement and institution builder, she helped organize the Igorot student movement in Manila in the 1970s and helped build the indigenous peoples’ movement in the Cordillera. Vicky has also established and run community-based health programs in various indigenous communities. She founded several institutions in support of the movement, including Community Health Education, Services and Research in the Cordillera (CHESTCORE, 1983), the Cordillera Women’s Education and Resource Center (CWERC, 1986), and Tebtebba (Indigenous Peoples’ International Centre for Policy Research and Education, 1996). She also helped build the indigenous women’s movement in the Philippines, elsewhere in Asia, and globally. She was one of the founders of the Asian Indigenous Women’s Network and the International Forum of Indigenous Women (FIMI). Vicky’s advisory group and board memberships include Conservation International, the UN Voluntary Fund for Indigenous Peoples, the UNDP Civil Society Advisory Committee, the International Forum on Globalization, and the Rights and Resources Group. She is currently a member of the Board of the International Land Tenure Facility, the South Centre, the Third World Network, FIMI, and the Bank Information Center. Myrna Cunningham (also known as Mirna) is a Miskita feminist and indigenous rights activist from Nicaragua. She served as the Chairperson of the United Nations Permanent Forum on Indigenous Issues until 2012, and she is the current president of the Association for Women's Rights in Development (AWID). Myrna is the first Miskito doctor in Nicaragua. She worked as a general practitioner and then as a surgeon until 1979. After the Sandinista revolution, she worked in the Ministry of Public Health and later became the first woman governor of the Waspam autonomous region. She helped negotiate several peace agreements after the conflict in Nicaragua, setting the stage for the Law of Autonomy of the Indigenous Peoples and Ethnic Communities from the Atlantic Coast of Nicaragua in 1987. She also helped create the first autonomous regional government. She served as the Deputy of the Autonomous Region of the North Atlantic Coast in the National Assembly. Myrna was a member of the Board of Directors of the Global Fund for Women and advised the Alliance of Indigenous Women of Mexico and Central America, the Continental Network of Indigenous Women and the International Indigenous Women's Forum. The human rights organization MADRE awarded Cunningham the Woman of Distinction Award in 2012. His entrepreneurial leadership has been associated with both venture capital and private equity portfolios responsible for guidance and/or holdings in some of the most successful technology start-ups over the last ten years, including Nest (Internet of things), Tesla (mobility), Recurrent (solar), and Codexis (biotech). From 2005 to 2008, Andy served as Assistant Secretary of Energy for Efficiency and Renewable Energy of the United States, managing the approximately $2 billion annual federal applied science, research and development portfolio. In this role he helped assemble significant bipartisan coalitions to implement or enact the Energy Policy Act, the Energy Independence and Security Act, and the America Competes Act, all of which remain the foundation of comprehensive energy policy today. In diplomacy, Andy was a principal climate negotiator of the "Bali Roadmap" and an original architect of the Major Economies Process. Prior to public service, Andy held several global leadership positions, including founder and CEO of Enercorp, a wind-power development firm and international agent of Vestas, involved in project development, management and financing of energy infrastructure; director and senior development manager for Wartsila Power Development and other multinational energy and development firms. Andy sits on several prominent boards including Applied Materials (Nasdaq: AMAT), Conservation International, The Gas Technology Institute, and the advisory board of MIT Medialab. Paul Klingenstein focuses on healthcare and healthcare technologies in the context of both venture capital and public health. He manages Aberdare Ventures and previously oversaw healthcare investing at Accel Partners. He has also worked at Warburg, Pincus, and at the Rockefeller Foundation. Paul serves on the board of the John D. and Catherine T. MacArthur Foundation, the London School of Hygiene and Tropical Medicine, The Campaign Legal Center, and several public and private healthcare companies. He is a former Board Chair of the International AIDS Vaccine Initiative and has served on the boards of various educational and community organizations. He received a Bachelor of Arts degree from Harvard and a Master’s of Business Administration from Stanford. Jennifer Morris provides strategic leadership for Conservation International and, as President, is responsible for delivery of the organization’s programs. With over 20 years of experience in international conservation and economic development, Jennifer has created and implemented cutting-edge initiatives working with diverse partners—from indigenous communities to multinational corporations—to achieve CI’s mission of protecting nature for the well-being of humanity. This includes oversight and direction for the Global Conservation Fund, which has helped protect more than 80 million hectares (197 million acres) around the world, invested US$ 66 million and generated more than US$ 1 million in wages for local economies, and CI’s Verde Ventures program, whose business partners today employ nearly 60,000 local people in 14 countries, and protection and restoration of more than half a million hectares (1.2 million acres) of important lands. Prior to joining CI in 1997, Jennifer was a business development consultant with a micro-finance institution and has lived and worked in Japan, Namibia, and Bolivia. She serves on the boards of several organizations including the SEED Initiative, the Conservation Strategy Fund, and the Natural Capital Coalition. She is a frequent presenter at international conferences, corporate events, and universities on issues related to conservation finance, corporate engagement, and social impact investing. Jennifer has a Master's degree in international affairs with a focus on business development and micro-finance from Columbia University’s School of International and Public Affairs and a Bachelor's degree in political science from Emory University. She currently lives in Washington, D.C., with her husband and daughter. For nearly 40 years, Peter Seligmann has been an influential and inspiring voice in conservation. He works in partnership with communities, governments, and businesses to find innovative solutions to ensure the sustainability of the planet’s natural and cultural resources. Peter co-founded Nia Tero in 2017. He is also the Chairman of the Board and former CEO of Conservation International, a global nonprofit organization he co-founded in 1987. Peter began his career in 1976 with The Nature Conservancy as the organization’s western region land steward, later becoming the director of the California Nature Conservancy. Peter earned a Master of Science in Forestry and Environmental Science from Yale University and a Bachelor of Science in Wildlife Ecology from Rutgers University. Peter holds Honorary Doctorates in Science from Michigan State University and Rutgers University. A world traveler, avid fisherman and diver, Peter lives in Seattle with his wife, Lee Rhodes, an entrepreneur and the founder of Glassybaby. Kevin Starr directs the Mulago Foundation, which is focused on scalable solutions to meet the basic needs of the very poor. Kevin established the Foundation's Rainer Arnhold Fellows Program in 2003 for social entrepreneurs focused on scalable solutions to poverty. He went on to establish the Henry Arnhold Fellows Program in 2016 that concentrates on finding scalable solutions to conservation and climate problems. Both the programs gives fellows a chance to design for impact that can go big. Kevin teaches and mentors fellows in numerous other programs for social entrepreneurs and is on the executive committee of Big Bang Philanthropy, a group of funders working together to direct more money to those best at fighting poverty. Nainoa Thompson is the president of the Polynesian Voyaging Society and a master in the traditional Polynesian art of non-instrument navigation. Through his voyaging, he has opened a global, multigenerational dialog on the importance of sustaining ocean resources and maritime heritage. Nainoa is the first person in 600 years to practice Polynesian wayfinding: long-distance open-ocean voyaging on a traditional double-hulled canoe without the aid of modern instruments. Nainoa has dedicated his life to exploring the ocean, maintaining the health of the planet, and ensuring that the ancient marine heritage and culture of Polynesia remain vibrant into the future.